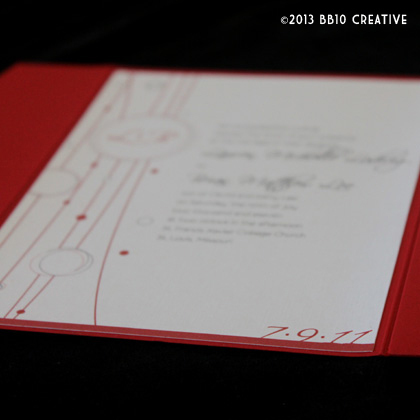 Next up on the blog we have another fun yet elegant invitation. 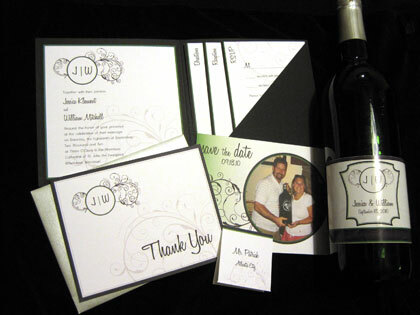 Danielle and Dustin had chosen “The Perfect Pair” as the theme for their wedding and were looking to incorporate the colors of pear green, chocolate brown and a champagne/cream color. I absolutely love these colors together, very clean, neutral and classic! 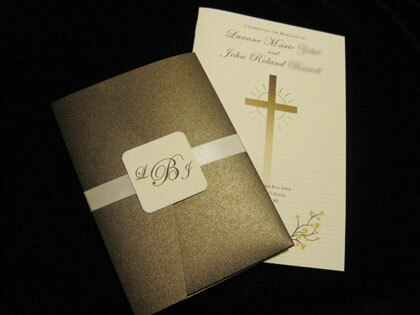 Since champagne was the main wedding color, we first decided on using a very pretty champagne colored metallic vertical pocket enclosure. 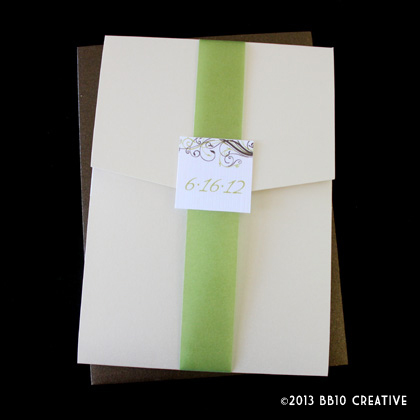 Once that was chosen, I used a bright white linen paper to pop against the soft champagne color for the invitation cards, where we used the accent colors of brown and pear green. 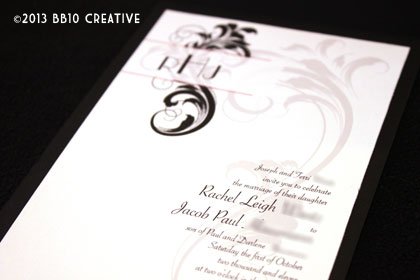 Danielle and Dustin chose a modern yet elegant flourish design, paired with stripes to frame the text, and a more modern script and formal sans serif font. 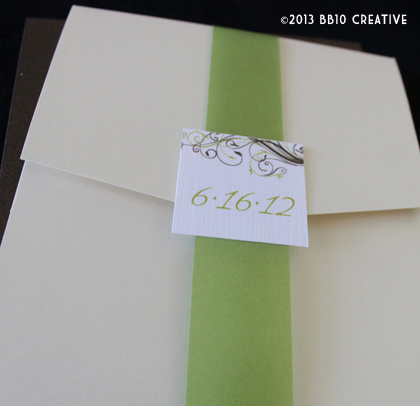 The flourish cascades over the additional cards in the invitation pocket, and the invitation was sealed using a pear green metallic belly band and a square closure that displays the wedding date. 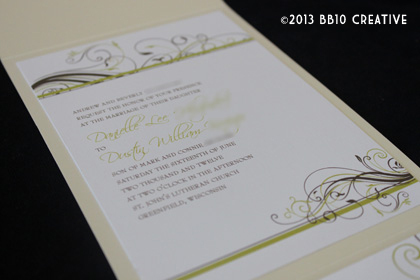 The invitation was sent in a metallic brown mailing envelope. 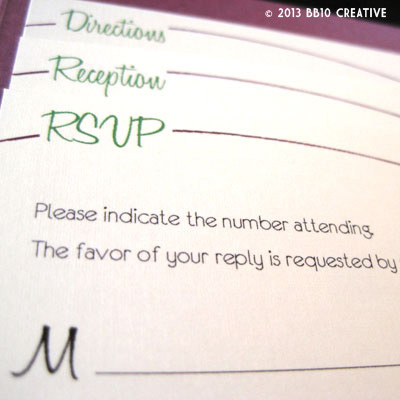 More invitations coming up soon including a Pittsburgh theme, birch tree/fall theme and a classy gray and orange invitation featuring a new panel pocket enclosure! 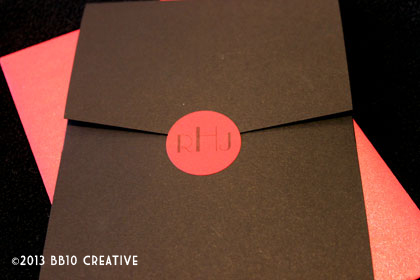 Erin and Andy came to BB10 Creative looking for invitations with a very specific look and feel. 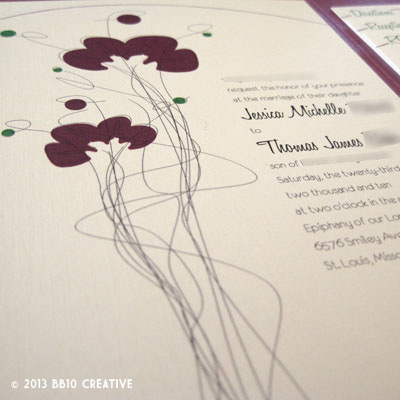 I had previously blogged about their Save the Date here. 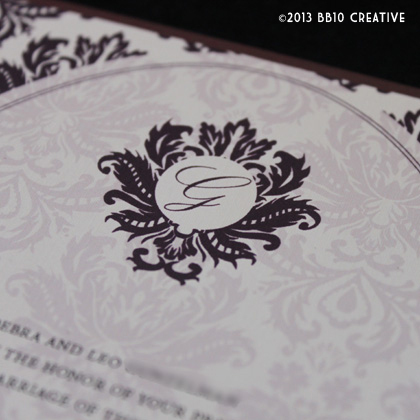 Erin really wanted to incorporate a French, late 20’s era Edwardian style theme in her wedding and the invitations needed to fit along with that. 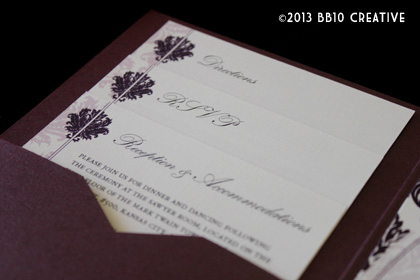 Their colors were eggplant with accents of deep red and orange, although in the end, we ended up only using the eggplant on the invitation, which I think lent itself well to the vintage look. 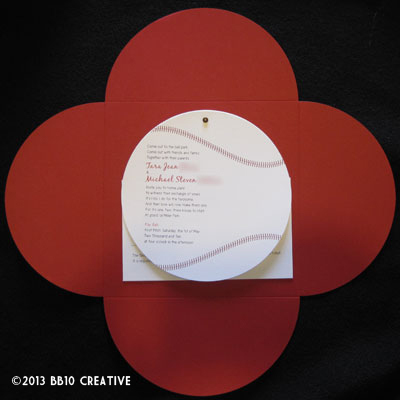 The design all started with a single, detailed damask style ornament which we used to create both a monogram for the invitation as well as the background pattern. 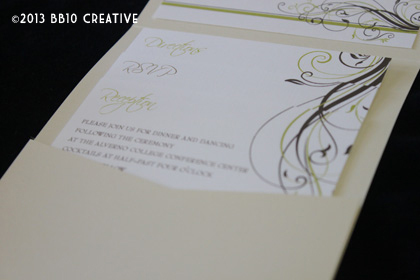 The double lines used within the design, along with an elegant Edwardian script and formal sans-serif font complete the look. This invitation uses a beautiful eggplant metallic horizontal pocket enclosure with a left-hand pocket, which is a bit different from the enclosures we normally use. 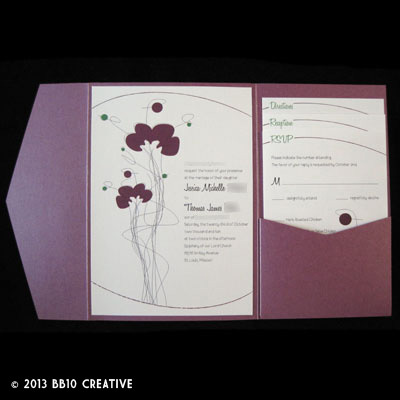 We printed the invitation on a bright white linen cardstock and housed the invitation in a matching eggplant metallic envelope. 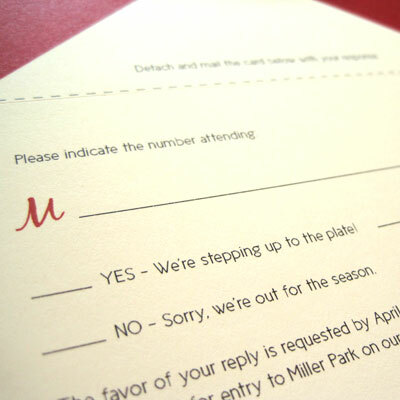 If you or someone you know are looking for a custom wedding invitation, no matter what the theme or style, have them contact us today to get started! 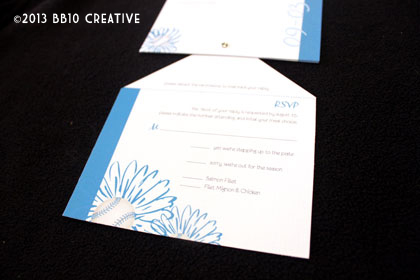 BB10 Creative starts all of our invitations from scratch, and they are completely customized to fit each of our clients’ needs. Yikes! 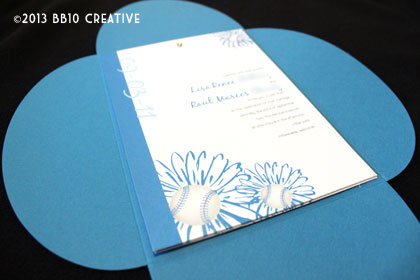 As an invitation designer, I am used to sending out invites 8 weeks before the wedding date, with a comfortable amount of design room built in before that. With the wedding less than 8 weeks out, we really needed to hustle on these! 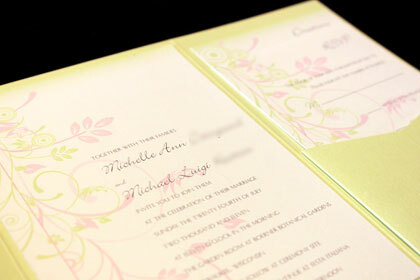 Luckily, Mike and Michelle were great clients who could make very fast decisions. 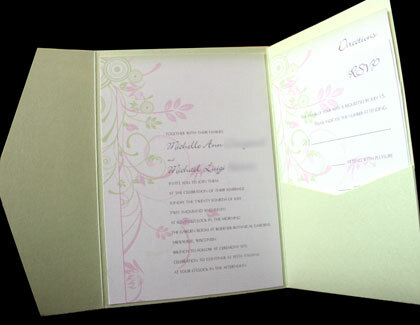 With the wedding color pallette of light green and soft pink, we made the decision to move forward using a soft green metallic horizontal pocket enclosure with a silver mailing envelope. 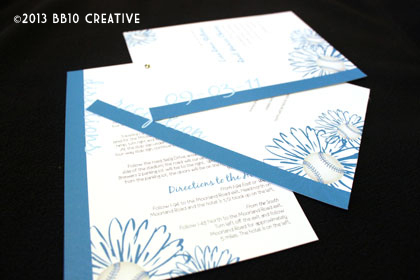 The couple was looking for an invitation design that was unique and fun, not too flowery, and said “casual summer wedding” while still appearing a tad formal. The ceremony was taking place in a botanical garden, while the reception was a much more casual event, so the invitation needed to speak to both parts. 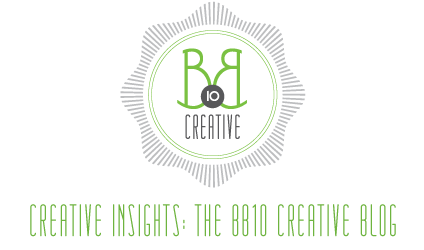 The final design incorporates a fun pink and green scroll design and an art deco-ish sans serif font paired with a fun script. 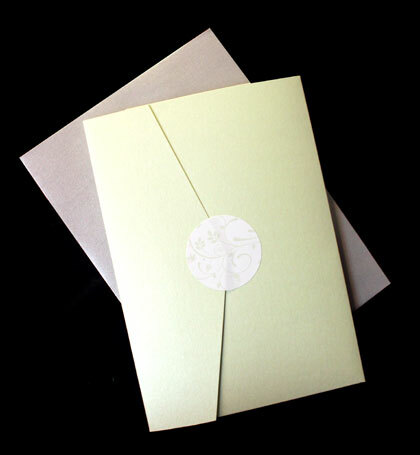 The invitation was printed on a clean white linen cardstock and the enclosure was sealed with a sticker to match the design. 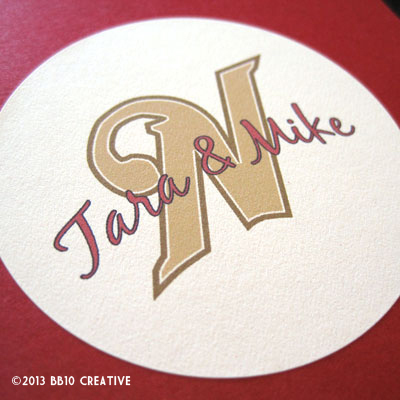 You may notice there is no formal “reception” card in this design, and that is because Mike and Michelle took a different approach to their celebration. They had a small private ceremony with family and decided to invite everyone to a private pavilion at Festa Italiana to celebrate their wedding. 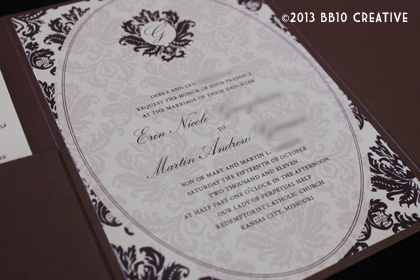 (When the groom’s middle name is Luigi, what do you expect?) 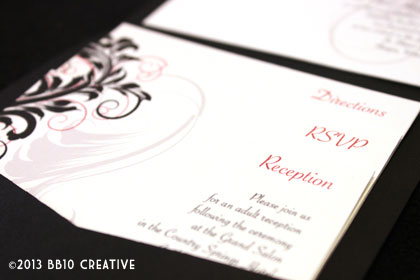 As a result, we sent out separate reception-only invitations which coordinated with the design. 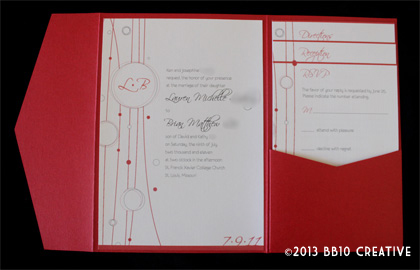 Although this was definitely the fastest set of invitations I have ever turned around, I’m still really pleased with the result and think it fit very well with the wedding that Mike and Michelle had planned. Congrats to the happy couple, it was a great day! 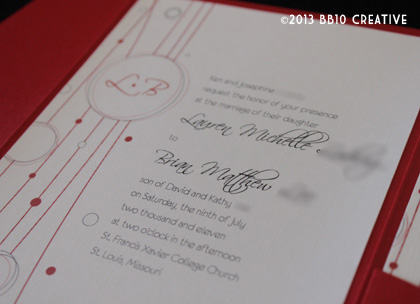 As you may have noticed in our wedding invitation work, the bulk of our clients choose to use enclosures for their wedding invitations, rather than use single or loose cards in an envelope. 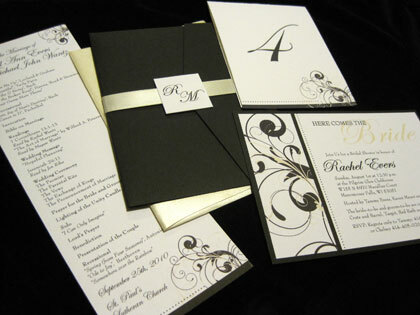 This trend in wedding invitations is very popular, and in my option, very practical because it not only helps to keep your invitation information together in a nice package for your guests, it also creates a very nice and unique presentation for the invitation. As a result of this, I thought it may be helpful to make a quick run down of the enclosure styles available through BB10 Creative. 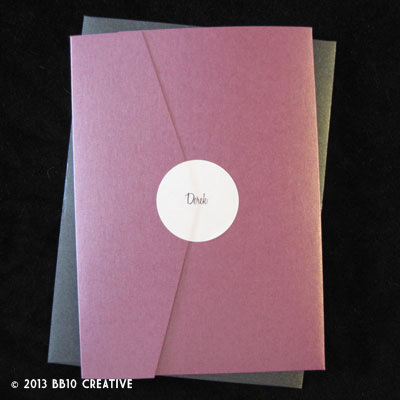 We do not manufacture our paper supplies, but we purchase them through other vendors and provide them at-cost to you. There is no mark up on our material cost. 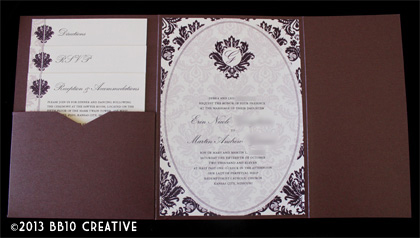 Enclosures are available in a wide variety of colors, but if we are unable to find one to match your particular wedding color, there are other options available for invitation designs that still create a great presentation and keep your information in a nice format for your guests. 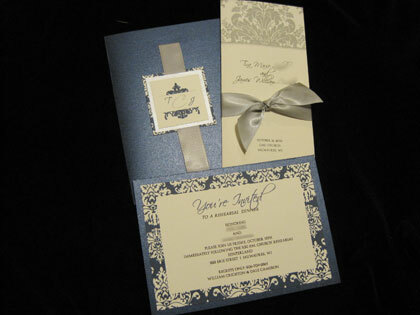 Contact us for more information or with any questions about our invitation styles. 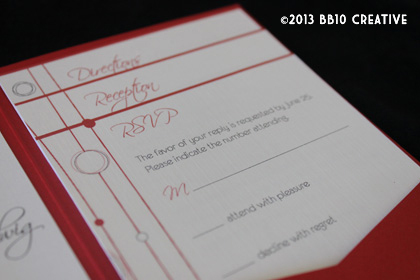 This 5×7 size of enclosure is very popular, and includes a pocket to house direction, accommodation and rsvp cards. 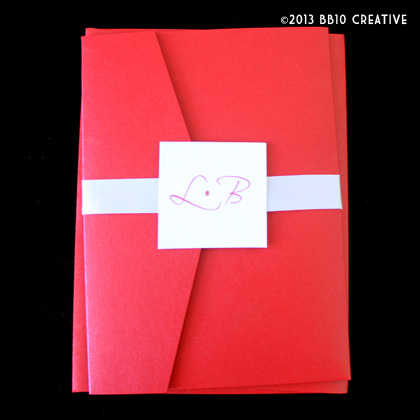 They can be sealed with a ribbon or paper sash, or with a decorative sticker. 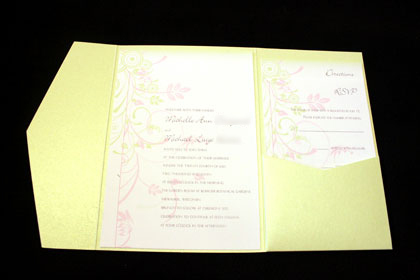 Similar to the vertical style, this is also a 5×7 size enclsoure and includes a pocket to house direction, accommodation and rsvp cards. 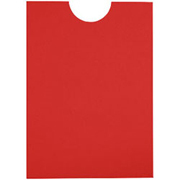 They can be sealed with a ribbon or paper sash, or with a decorative sticker. The pochette enclosure is very versatile. 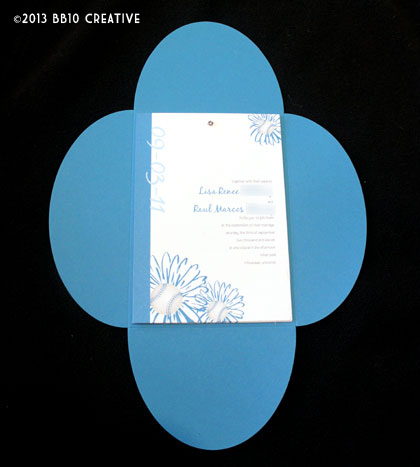 It is also a 5×7 size, and has four pointed flaps that can close around your invitation cards and can be sealed with a decorative sticker. 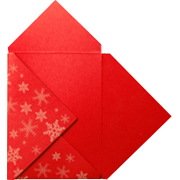 You can also use two of the four flaps instead to wrap over the top for a different look. The bloom enclosure is another popular style available in a 5×7, 5×5 or 6×6. 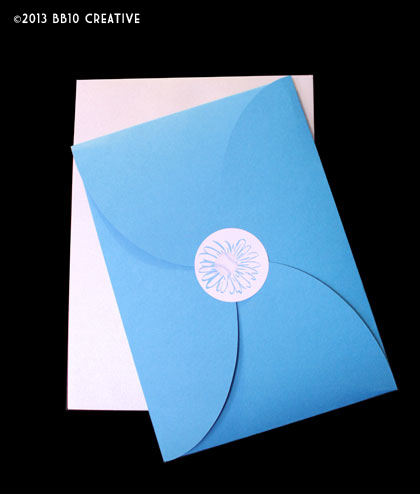 The four rounded flaps fold in on each other to create a seal that resembles a floral bloom. The bloom enclosure works best when sealed with a decorative sticker. 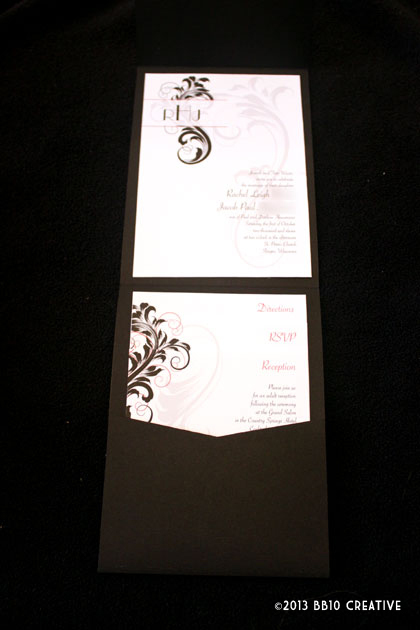 The half moon enclosure is one big 5×7 pocket that can house all of your invitation cards. 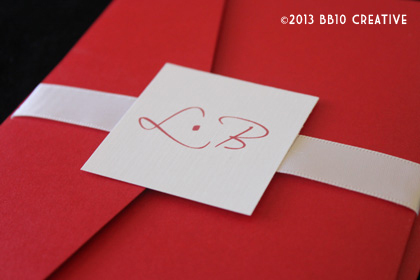 The enclosure itself can be dressed up with decorative monogram stickers, paper and ribbon sashes. 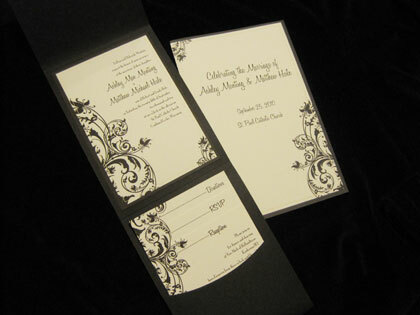 Much like the vertical and horizontal pocket enclosures, the square pocket enclosure includes a pocket to house your invitation cards. 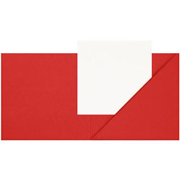 The unique shape definitely stands out in the mail, but be aware the square shape incurs and additional postage fee from USPS.